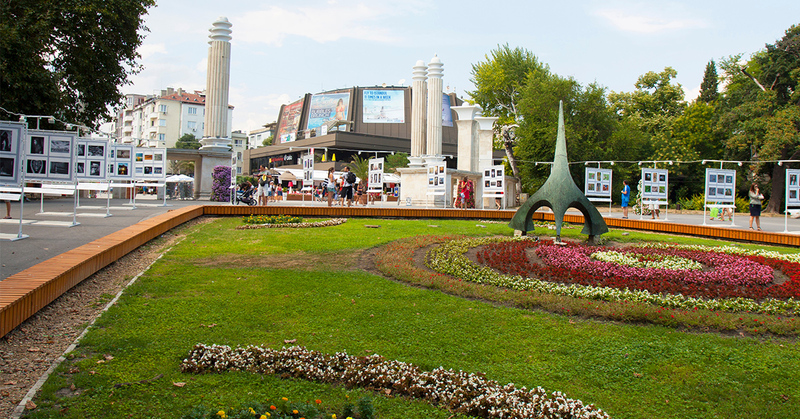 Varna is one of the best places for vacation on the Black Sea coast. A growing and lively resort perfectly blended somewhere in between ancient history and modern culture. While Varna has great beaches and plenty of fun experiences to enjoy, everyone will find a reason to escape the big city every now and then. So why not go on a day trip outside Varna? 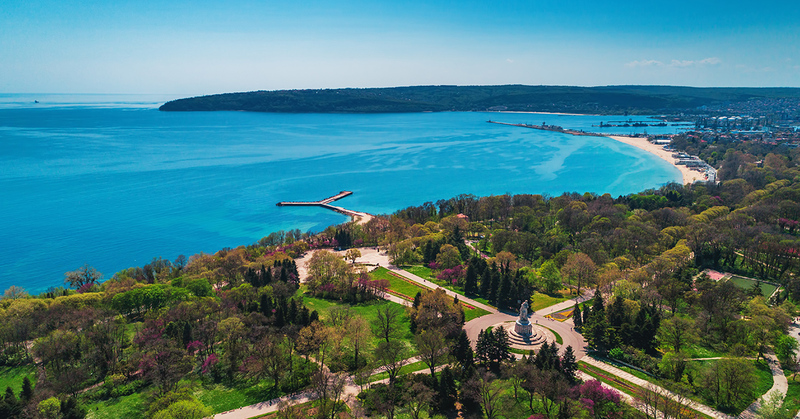 Here are some of our favourite spots Southeast of Varna – amazing backdrops for selfies and a way to chill out and connect with nature! Compared to noisy nearby resorts, Balchik is a breath of fresh air and the perfect low key holiday spot. 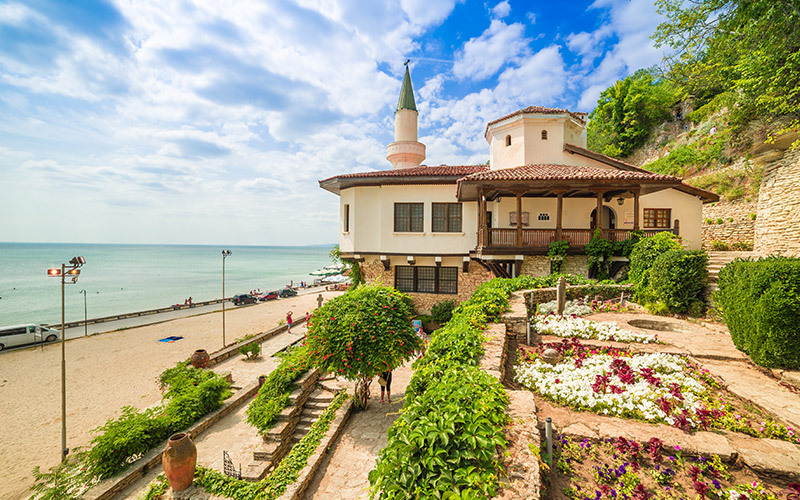 The small town of Balchik is much calmer than the other resorts down the sea coast. But there are luxury hotels, nice places to dine and a really unique Botanical Garden and Palace to enjoy there! The Caste of Queen Mary can be described as an oasis. The Castle was built in 1937 for Queen Mary who was the ruler of Romania. The construction of the palace was carried out by Italian architects Augustino and Amerigo, while a florist was hired from Switzerland to arrange the park. Queen Mary was known for her great taste and built the castle in an oriental style – elegant and cosy. The Castle is situated a few meters away from the sea so you get a really great view of the bay from there. Besides the castle, the estate also has several villas, a Botanical Garden with waterfalls and streams, Roman baths and The Stella Maris Chapel (where the queen was laid to rest after her death). The real gem here is the beautiful Botanical Garden. It has an amazing sea view, many flowers and plants arranged perfectly and a few streams and waterfalls (including an impressive 9-meter waterfall). It’s a great place for a relaxing walk, surrounded by beauty. Tip: Make sure to stop by the winery which is located in the botanical garden. The wine degustations are free of charge and the majority of the wines are made with honey (dessert wines). Try the fig wine (everyone’s favourite), the snow wine and the rose (they are all amazing). An average bottle of wine costs between 15-20 euros. Entry fee for the castle and botanical garden is around 20 lv. If you plan to visit the winery you will need to buy a ticket for the botanical garden. Call+359 57 925 29 for more information. 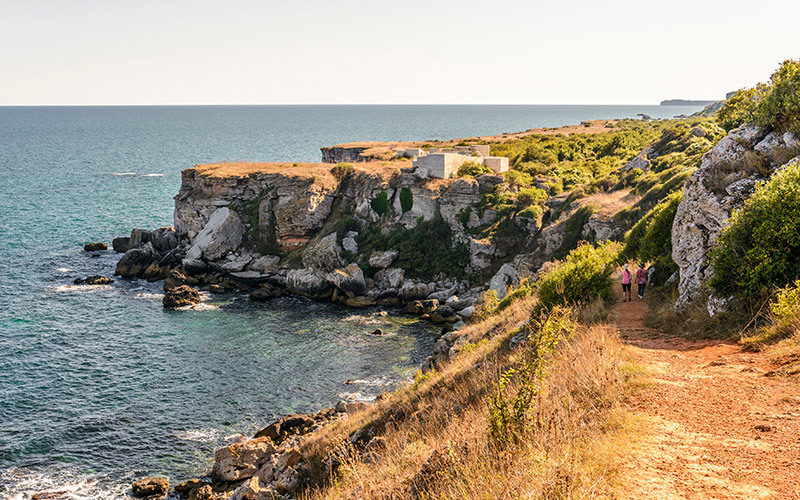 The rich history, well-preserved landscape and beautiful panoramic views make Cape Kaliakra one of the most attractive tourist spots on the Black Sea coast. It is a truly special place with a lot of history and nothing but endless sea views for miles. 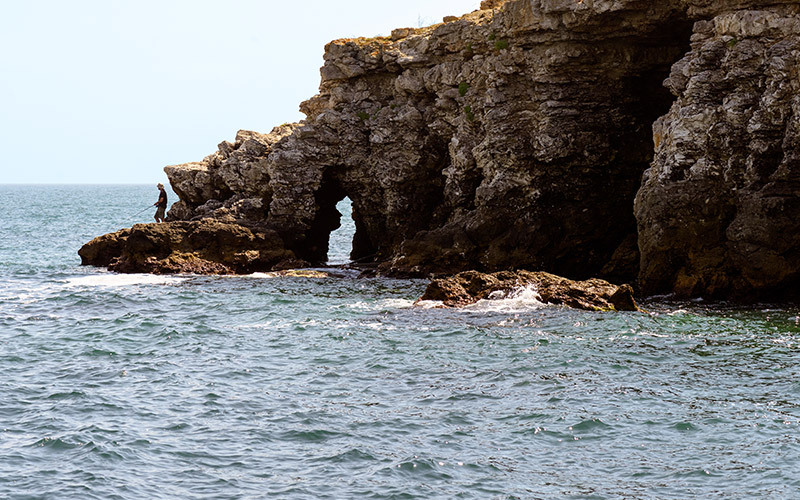 Cape Kaliakra was first settled by the Thracians. It has been inhabited almost continuously throughout the centuries by Thracians, Romans, Byzantines, Greeks, Bulgarians. You can still see remains of the fortification, part of the second fortress wall, graves, Roman baths and the foundations of a medieval church. There’s a museum in one of the Cape’s caves that shows archaeological finds discovered on the cape and the region. The model that demonstrates how the ancient fortress looked like in the past is really interesting. Tickets to the Archaeological Reserve of Cape Kaliakra cost 3 lv for adults and 1.50 for children. Phone for more information: +359 88 427 4132. 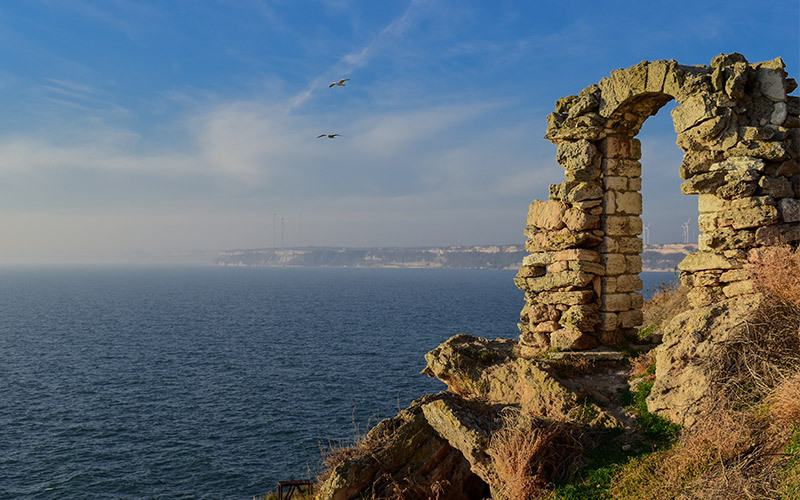 The most famous legend tells the story of 40 Bulgarian girls led by the beautiful Kaliakra who jumped from the rocks and into the sea to escape from the Ottomans. They braided their hair together to make sure no one would back away. Try some delicious seafood from The Mussel farm (ecologically clean Black Sea mussels) in restaurant ‘’Dalboka’’ – just next to the Cape. The restaurant offers a rich menu with fresh mussels from their farm as well as many other seafood dishes (the mussel soup is the best). It’s a great place to try local fish delicacies! 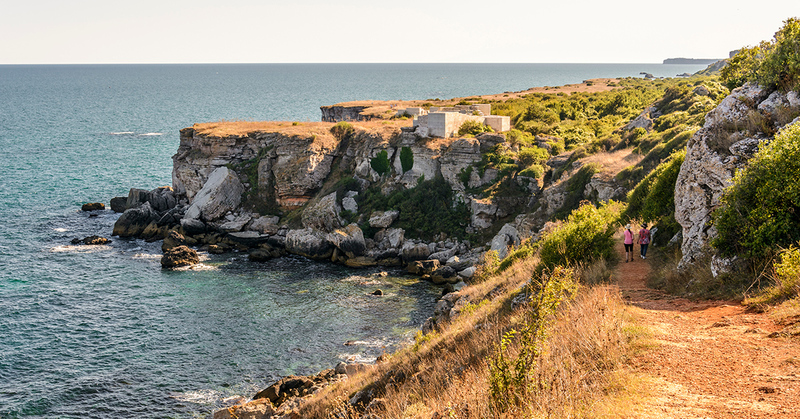 Bolata bay is located within the “Bolata” reserve and is the only reserve in Bulgaria that includes part of the sea and sea area on its territory. It’s a refreshing change to be able to go to a beach that has not been turned into a “tourist trap”. It’s visited mostly by locals and since it’s part of a reserve the water is incredibly clean. If you want a clean beach, where you can relax all day in the sun without having to spend a lot of money, grab a towel and head down to the Bolata bay. 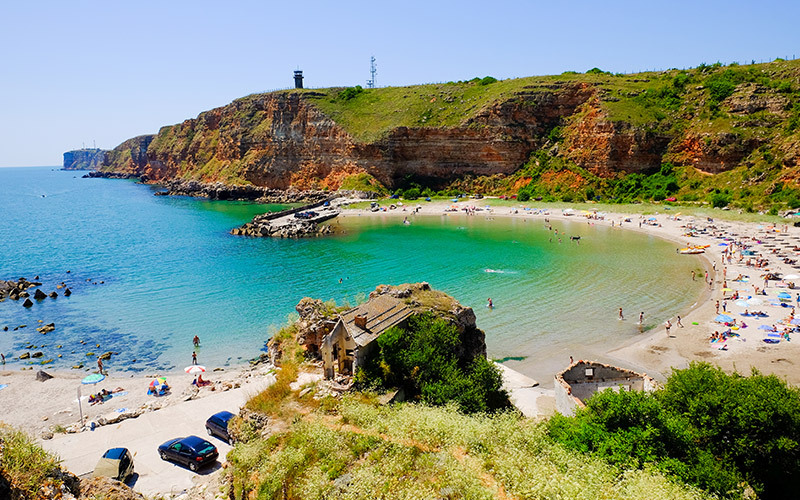 You can lay on the golden sand, take a dip in the crystal clear blue water or climb the cliff for the most amazing panoramic view of the bay (really worth the steep climb!). You will need to bring your own food and drinks as there are no facilities or constructions anywhere along the bay. 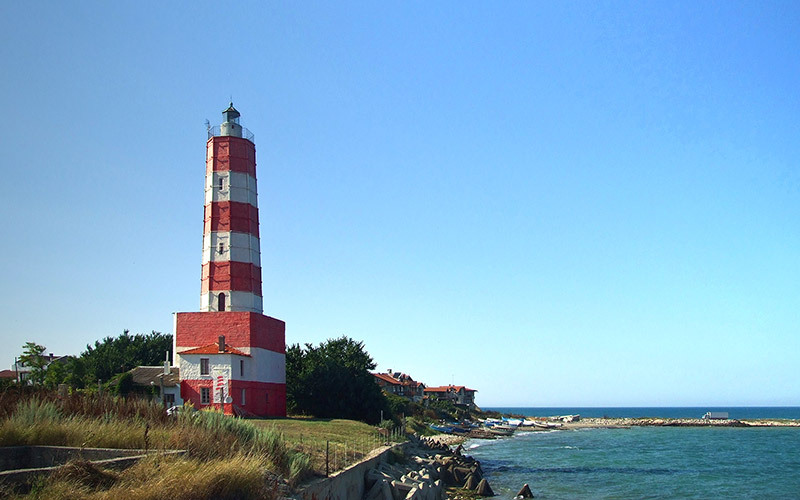 The oldest functioning lighthouse on the Balkans is in the region of Shabla. There are many sunken vessels and submarines from WWII in the area making it a preferred destination for diving. The seaside here is unique and one of its kind – there are no hotels and restaurants around, and the sea is clean and pleasant. 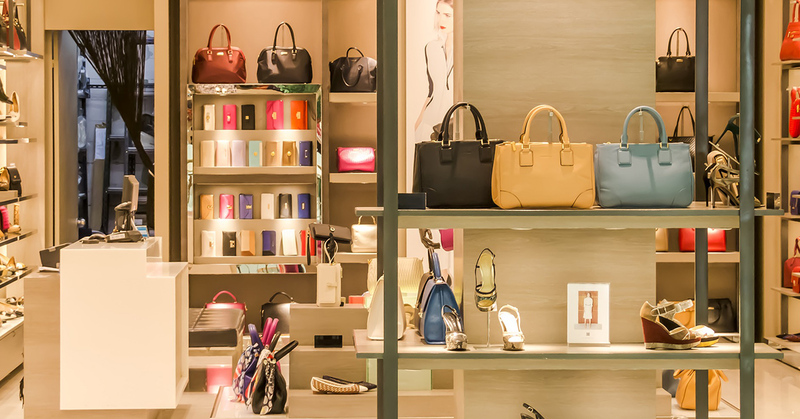 Despite the lack of luxury hotels, there are still places to stay. You can find a few small ones in the region, bungalows, villas and guesthouses. The prices are much cheaper than the big resorts and if you book early you might just get a really good deal (15-30 lv per bed during the high season). Fun fact: Shabla is the easternmost point of the coast and the first place in the country where the sun comes to shine upon early in the morning. You can find Camping Dobrudja along the wide beaches near Shabla. The facilities there offer some nice places to eat, drink and toilets. Lake Shabla is a protected area about 5 km from the town of Shabla. Over 247 bird species live there and around 7 fish species which have been included in the red book. The area also covers a lake with unique, healing mud. The healing properties of the mud attract most of the visitors in the camping site who come to make use of its benefits. The village of Kamen Bryag and its rocky seafront is an attractive place for those who prefer wild, untouched nature. It’s perfect for those who like rock climbing, fresh air, crystal clear water and for the fans of history – archaeological finds dating back thousands of years. On the beach in front of the village, you can enjoy the amazing panorama as the view of the sea goes for many kilometres north and south. An extremely popular climbing area called ”Fire” is also located there. Young people head down there for the summer and choose to sleep in tents and sleeping bags. The Yailata area is about 2 km south of Kamen Bryag and is a very ancient place (inhabited for 7 millennia). A Thracian necropolis was found in the area (2nd century) and the 101 cave houses there are believed to have been inhabited by the Sarmatian tribes once. The reserve is now home to more than 50 bird species and 19 rare and endangered plants. 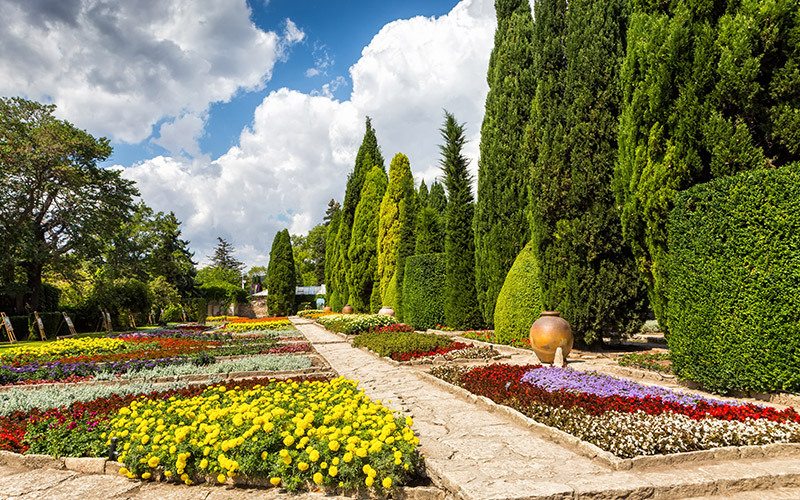 The University Botanical Garden in Varna is the first Eco-park in the country that harmoniously combines artificial and natural ecosystems. It’s a great place to get to know interesting plant and animal species, go on a walk around the garden and make some time for recreation in nature. 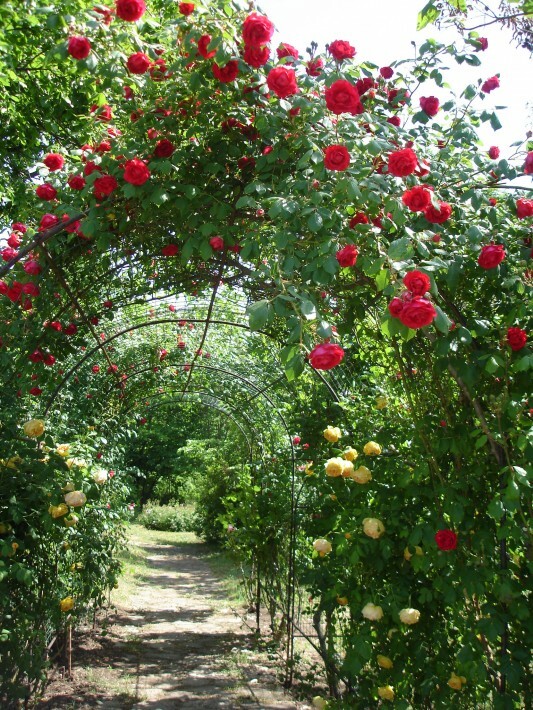 There’s an incredible Rosarium inside the garden, set on an area of about 2 acres where you can see more than 70 varieties of ornamental roses. Strongly aromatic, with large flashy colours, are the new English varieties of roses. The Rosa Floribunda and Wichuraiana are also really attractive. The Golden Sands Nature Park is the smallest (13.2 sq km) of the 11 nature parks in the country. It is located 17 km northeast of Varna. Inside the park, there are four marked tourist trails and an additional five specialized trails, which present perfectly just how beautiful the region is! 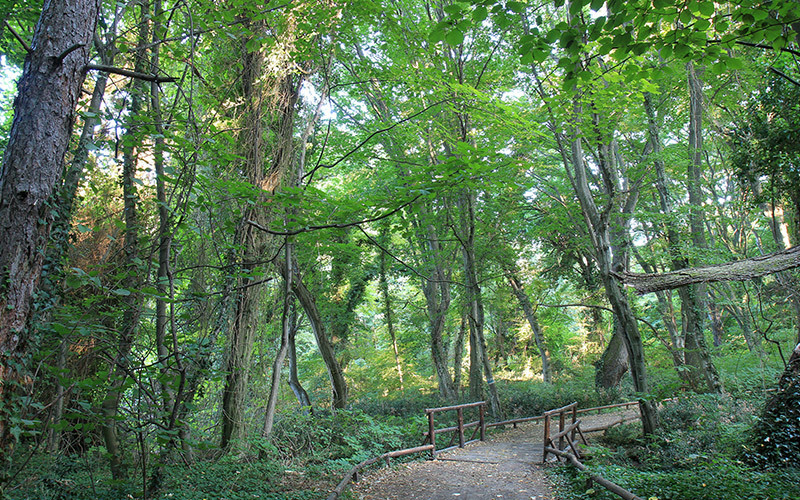 A great place for hiking, nature exploration, tourism, cycling, children’s tourism and taking photos! Along the trails, there are picnic areas – penthouses and alcoves with benches, tables and fireplaces situated near old fountains with drinkable water. There are many spots that offer panoramic views of the sea, the park and the resort. Bulgaria has long been famous for its combination of beautiful nature, mountains and sea. So why not take advantage of all the beauty it has to offer? Now that you know about these amazing places around Varna and the Black Sea coast, you can experience it for yourself. Let Varna City Card be your personal guide!